We are a leading Wholesale Trader of stainless steel union ferrule fittings, nickel alloys cap ferrule fittings, nickel alloys 90 degree elbow ferrule fittings, nickel alloys union ferrule fittings, nickel alloys tee ferrule fittings and stainless steel cap ferrule fittings from Mumbai, India. NeelKamal Steels is a leading stockholder and supplier of pipe fittings with the feature of compression which is also known as Stainless Steel union Ferrule Fittings in 304 and 316 grades. According to the demand of the customer we are capable of supplying Stainless Steel union Ferrule Fittings in different grades such as nickel alloys, brass, carbon steel, copper, etc. 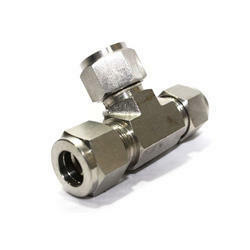 We supply wide ranges single and double Stainless Steel union Ferrule Fittings with different configurations and sizes. In the time of installation the double ferrule tube fittings do not require metal flaring. With the help of various applications they are just compressed on tubes to make it sturdy and leak proof connection to get rid of leakage in power and instrumentation applications. 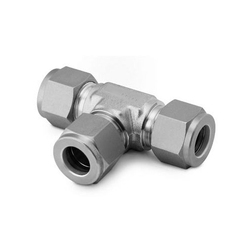 These types of Stainless Steel union Ferrule Fittings are used mainly in pneumatic and hydraulic applications in various industries such as petrochemicals, oil and gas, fertilizers and power generations and natural gas. All our products are made up of premium quality raw materials which makes us the top company in this field. NeelKamal Steels is a leading stockholder and supplier of pipe fittings with the feature of compression which is also known as Nickel Alloys Cap Ferrule Fittings in 304 and 316 grades. According to the demand of the customer we are capable of supplying Nickel Alloys Cap Ferrule Fittings in different grades such as nickel alloys, brass, carbon steel, copper, etc. We supply wide ranges single and double Nickel Alloys Cap Ferrule Fittings with different configurations and sizes. In the time of installation the double ferrule tube fittings do not require metal flaring. With the help of various applications they are just compressed on tubes to make it st urdy and leak proof connection to get rid of leakage in power and instrumentation applications. 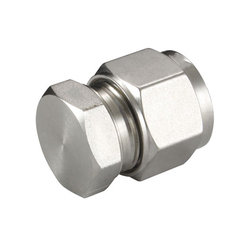 These types of Nickel Alloys Cap Ferrule Fittings are used mainly in pneumatic and hydraulic applications in various industries such as petrochemicals, oil and gas, fertilizers and power generations and natural gas. All our products are made up of premium quality raw materials which makes us the top company in this field. NeelKamal Steels is a leading stockholder and supplier of pipe fittings with the feature of compression which is also known as Nickel Alloys 90 degree Elbow Ferrule Fittings in 304 and 316 grades. According to the demand of the customer we are capable of supplying Nickel Alloys 90 degree Elbow Ferrule Fittings in different grades such as nickel alloys, brass, carbon steel, copper, etc. We supply wide ranges single and double Nickel Alloys 90 degree Elbow Ferrule Fittings with different configurations and sizes. 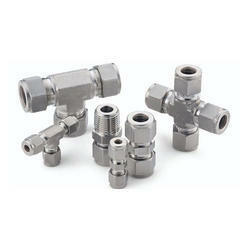 In the time of installation the double ferrule tube fittings do not require metal flaring. With the help of various applications they are just compressed on tubes to make it sturdy and leak proof connection to get rid of leakage in power and instrumentation applications. 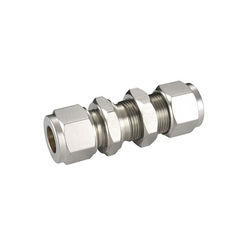 These types of Nickel Alloys 90 degree Elbow Ferrule Fittings are used mainly in pneumatic and hydraulic applications in various industries such as petrochemicals, oil and gas, fertilizers and power generations and natural gas. All our products are made up of premium quality raw materials which makes us the top company in this field. NeelKamal Steels is a leading stockholder and supplier of pipe fittings with the feature of compression which is also known as Nickel Alloys union Ferrule Fittings in 304 and 316 grades. According to the demand of the customer we are capable of supplying Nickel Alloys union Ferrule Fittings in different grades such as nickel alloys, brass, carbon steel, copper, etc. 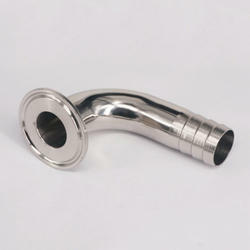 We supply wide ranges single and double Nickel Alloys union Ferrule Fittings with different configurations and sizes. In the time of installation the double ferrule tube fittings do not require metal flaring. With the help of various applications they are just compressed on tubes to make it sturdy and leak proof connection to get rid of leakage in power and instrumentation applications. These types of Nickel Alloys union Ferrule Fittings are used mainly in pneumatic and hydraulic applications in various industries such as petrochemicals, oil and gas, fertilizers and power generations and natural gas. All our products are made up of premium quality raw materials which makes us the top company in this field. NeelKamal Steels is a leading stockholder and supplier of pipe fittings with the feature of compression which is also known as Nickel Alloys TEE Ferrule Fittings in 304 and 316 grades. According to the demand of the customer we are capable of supplying Nickel Alloys TEE Ferrule Fittings in different grades such as nickel alloys, brass, carbon steel, copper, etc. We supply wide ranges single and double Nickel Alloys TEE Ferrule Fittings with different configurations and sizes. In the time of installation the double ferrule tube fittings do not require metal flaring. With the help of various applications they are just compressed on tubes to make it sturdy and leak proof connection to get rid of leakage in power and instrumentation applications. These types of Nickel Alloys TEE Ferrule Fittings are used mainly in pneumatic and hydraulic applications in various industries such as petrochemicals, oil and gas, fertilizers and power generations and natural gas. All our products are made up of premium quality raw materials which makes us the top company in this field. NeelKamal Steels is a leading stockholder and supplier of pipe fittings with the feature of compression which is also known as Stainless Steel Cap Ferrule Fittings in 304 and 316 grades. According to the demand of the customer we are capable of supplying Stainless Steel Cap Ferrule Fittings in different grades such as nickel alloys, brass, carbon steel, copper, etc. We supply wide ranges single and double Stainless Steel Cap Ferrule Fittings with different configurations and sizes. In the time of installation the double ferrule tube fittings do not require metal flaring. With the help of various applications they are just compressed on tubes to make it sturdy and leak proof connection to get rid of leakage in power and instrumentation applications. 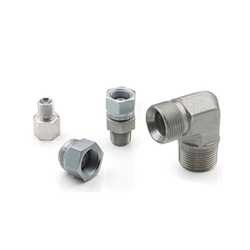 These types of Stainless Steel Cap Ferrule Fittings are used mainly in pneumatic and hydraulic applications in various industries such as petrochemicals, oil and gas, fertilizers and power generations and natural gas. All our products are made up of premium quality raw materials which makes us the top company in this field. NeelKamal Steels is a leading stockholder and supplier of pipe fittings with the feature of compression which is also known as Stainless Steel Coupling Ferrule Fittings in 304 and 316 grades. According to the demand of the customer we are capable of supplying Stainless Steel Coupling Ferrule Fittings in different grades such as nickel alloys, brass, carbon steel, copper, etc. We supply wide ranges single and double Stainless Steel Coupling Ferrule Fittings with different configurations and sizes. In the time of installation the double ferrule tube fittings do not require metal flaring. With the help of various applications they are just compressed on tubes to make it sturdy and leak proof connection to get rid of leakage in power and instrumentation applications. 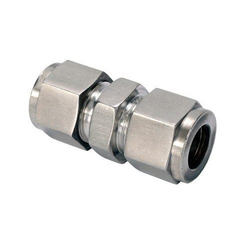 These types of Stainless Steel Coupling Ferrule Fittings are used mainly in pneumatic and hydraulic applications in various industries such as petrochemicals, oil and gas, fertilizers and power generations and natural gas. All our products are made up of premium quality raw materials which makes us the top company in this field. NeelKamal Steels is a leading stockholder and supplier of pipe fittings with the feature of compression which is also known as Stainless Steel Bushing Ferrule Fittings in 304 and 316 grades. According to the demand of the customer we are capable of supplying Stainless Steel Bushing Ferrule Fittings in different grades such as nickel alloys, brass, carbon steel, copper, etc. We supply wide ranges single and double Stainless Steel Bushing Ferrule Fittings with different configurations and sizes. In the time of installation the double ferrule tube fittings do not require metal flaring. With the help of various applications they are just compressed on tubes to make it sturdy and leak proof connection to get rid of leakage in power and instrumentation applications. These types of Stainless Steel Bushing Ferrule Fittings are used mainly in pneumatic and hydraulic applications in various industries such as petrochemicals, oil and gas, fertilizers and power generations and natural gas. All our products are made up of premium quality raw materials which makes us the top company in this field. NeelKamal Steels is a leading stockholder and supplier of pipe fittings with the feature of compression which is also known as Stainless Steel Hex Head Plug Ferrule Fittings in 304 and 316 grades. According to the demand of the customer we are capable of supplying Stainless Steel Hex Head Plug Ferrule Fittings in different grades such as nickel alloys, brass, carbon steel, copper, etc. We supply wide ranges single and double Stainless Steel Hex Head Plug Ferrule Fittings with different configurations and sizes. In the time of installation the double ferrule tube fittings do not require metal flaring. With the help of various applications they are just compressed on tubes to make it sturdy and leak proof connection to get rid of leakage in power and instrumentation applications. 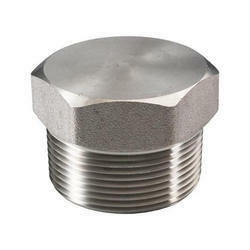 These types of Stainless Steel Hex Head Plug Ferrule Fittings are used mainly in pneumatic and hydraulic applications in various industries such as petrochemicals, oil and gas, fertilizers and power generations and natural gas. All our products are made up of premium quality raw materials which makes us the top company in this field. NeelKamal Steels is a leading stockholder and supplier of pipe fittings with the feature of compression which is also known as Nickel Alloys Hex Head Plug Ferrule Fittings in 304 and 316 grades. According to the demand of the customer we are capable of supplying Nickel Alloys Hex Head Plug Ferrule Fittings in different grades such as nickel alloys, brass, carbon steel, copper, etc. We supply wide ranges single and double Nickel Alloys Hex Head Plug Ferrule Fittings with different configurations and sizes. In the time of installation the double ferrule tube fittings do not require metal flaring. With the help of various applications they are just compressed on tubes to make it sturdy and leak proof connection to get rid of leakage in power and instrumentation applications. These types of Nickel Alloys Hex Head Plug Ferrule Fittings are used mainly in pneumatic and hydraulic applications in various industries such as petrochemicals, oil and gas, fertilizers and power generations and natural gas. All our products are made up of premium quality raw materials which makes us the top company in this field. NeelKamal Steels is a leading stockholder and supplier of pipe fittings with the feature of compression which is also known as Nickel Alloys 45 Degree Elbow Ferrule Fittings in 304 and 316 grades. According to the demand of the customer we are capable of supplying Nickel Alloys 45 Degree Elbow Ferrule Fittings in different grades such as nickel alloys, brass, carbon steel, copper, etc. We supply wide ranges single and double Nickel Alloys 45 Degree Elbow Ferrule Fittings with different configurations and sizes. In the time of installation the double ferrule tube fittings do not require metal flaring. With the help of various applications they are just compressed on tubes to make it sturdy and leak proof connection to get rid of leakage in power and instrumentation applications. These types of Nickel Alloys 45 Degree Elbow Ferrule Fittings are used mainly in pneumatic and hydraulic applications in various industries such as petrochemicals, oil and gas, fertilizers and power generations and natural gas. All our products are made up of premium quality raw materials which makes us the top company in this field. NeelKamal Steels is a leading stockholder and supplier of pipe fittings with the feature of compression which is also known as Stainless Steel TEE Ferrule Fittings in 304 and 316 grades. According to the demand of the customer we are capable of supplying Stainless Steel TEE Ferrule Fittings in different grades such as nickel alloys, brass, carbon steel, copper, etc. 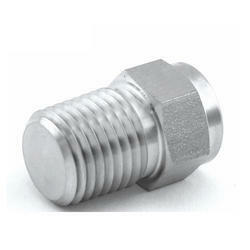 We supply wide ranges single and double Stainless Steel TEE Ferrule Fittings with different configurations and sizes. In the time of installation the double ferrule tube fittings do not require metal flaring. With the help of various applications they are just compressed on tubes to make it sturdy and leak proof connection to get rid of leakage in power and instrumentation applications. These types of Stainless Steel TEE Ferrule Fittings are used mainly in pneumatic and hydraulic applications in various industries such as petrochemicals, oil and gas, fertilizers and power generations and natural gas. All our products are made up of premium quality raw materials which makes us the top company in this field. NeelKamal Steels is a leading stockholder and supplier of pipe fittings with the feature of compression which is also known as Stainless Steel 90 degree Elbow Ferrule Fittings in 304 and 316 grades. 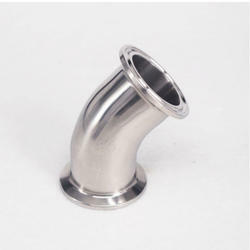 According to the demand of the customer we are capable of supplying Stainless Steel 90 degree Elbow Ferrule Fittings in different grades such as nickel alloys, brass, carbon steel, copper, etc. 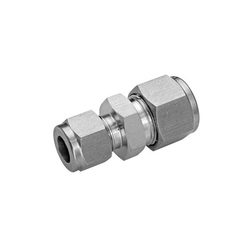 We supply wide ranges single and double Stainless Steel 90 degree Elbow Ferrule Fittings with different configurations and sizes. In the time of installation the double ferrule tube fittings do not require metal flaring. With the help of various applications they are just compressed on tubes to make it sturdy and leak proof connection to get rid of leakage in power and instrumentation applications. 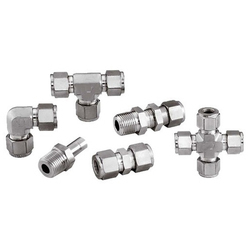 These types of Stainless Steel 90 degree Elbow Ferrule Fittings are used mainly in pneumatic and hydraulic applications in various industries such as petrochemicals, oil and gas, fertilizers and power generations and natural gas. All our products are made up of premium quality raw materials which makes us the top company in this field.